Kwam Im Goddess Temple is part of Manggar District’s tourism. If you are visiting Belitung, the temple should be in your list. It is located in Burung Mandi Village. The fact is the temple becomes the biggest and oldest monastery in Belitung Island. Most of the people come here either to pray or enjoy a vacation. The age of the monastery is more than 266 years old. It was found in 1747. It also becomes the symbol of religious harmony. In fact, the temple is located in Muslim settlement. At the first glance, Kwam Im Goddess Temple has a majestic appearance. It features two stairs. The thing is this monastery is located in a highland, so you must use the stairs to reach it. In the first floor, you can find chairs. These are a perfect spot to relax. In front of the temple, there are some plants and bushes. Several trees also surround this beautiful tourist spot. The temple applies red color. It is a dominant vibrant of this building. There are several rooms, as well. You can explore them all. In order to reach the temple, you should take the stairs. Once you reach the first floor, you may find three different places for praying. First, it is called Shimunyo. The location is near to the stairs. Next, you have Sitiyamuni. It is located on the next level. The highest floor is the home of the biggest temple. The name is Kon Im. Each of these structures is both unique and beautiful. You can take some pictures of them, as well. Inside the temple, there are some statues of Kwan Im Goddess. Another attraction is her painting sitting on a lotus. Most of the visitors come to pray. Thus, you may expect lots of people during religious days. The most crowded time is during Waisak and Imlek. There are not only local visitors but also foreigners. The temple becomes famous due to its rumor. Many people said their wishes had been granted. It was because they often came to Kwam Im Goddess Temple. No one can tell whether it is true or not. The thing is the visitors keep coming every day. 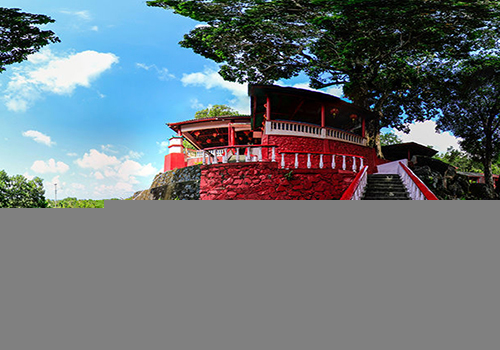 Apart from being a place for worshipping, Kwam Im Goddess Temple offers beautiful views. In the back of the temple, you can witness a gorgeous view of Burung Mandi Mountain. In some occasions, there are several wild monkeys coming to the temple. Moreover, it features good facilities like a parking area and ornaments. If you need something, you can talk to the keeper. He is quite friendly. Your destination is Manggar District. From Tanjung Pandan City, you should take Badau Street. Next, you must use Tanjung Pandan Tengah Street to Manggar. The trip takes about 1 – 2 hours. It depends on the type of your vehicle. The distance is approximately 78 km. If you come from Gantung, it takes less than an hour. The distance is 35 km. From Gantung, you must take Sudirman Street and Manggar Raya Street. Both of the routes are comfortable, actually.